Well this took a bit longer than I’d planned… WAY BACK in episode 11 I did Part 1 of a two-part series on tantrums, and was expecting to release the second episode in short order. Then I got inundated with interviews from awesome guests, which I always wanted to release as soon as I could after I spoke with them, and months have gone by without releasing that second episode. Episode 11 provided a lot of background information on tantrums: a seminal study in 1931 really forms the basis for all the research on tantrums that has been done since then, so we went through it in some depth to understand what those researchers found – I was surprised that so much of the information was still relevant to parents today. This episode considers the more recent literature – of which there actually isn’t a huge amount – to help us understand what’s going on during a tantrum, how to deal with them once they start, and how to potentially head them off before they even fully develop (don’t we all want that?!). Denham, S.A., & Burton, R. (2003). Social and emotional prevention and intervention programming for preschoolers. New York: Kluwer Academic/Plenum. Levine, L.J. (1995). Young children’s understanding of the causes of anger and sadness. Child Development 66(2), 697-709. LeVine, R., & LeVine, S. (2016). Do parents matter? Why Japanese babies sleep soundly, Mexican siblings don’t fight, and American families should just relax. New York: Public Affairs. Lieberman, M.D., Eisenberger, N.E., Crockett, M.J., Tom, S.M., Pfeifer, J.H., & Way, B.M. (2007). Putting feelings into words: Affect labeling disrupts amygdala activity in response to affective stimuli. Psychological Science 18(5), 421-428. Parens, H. (1987). Aggression in our children: Coping with it constructively. Northvale, NJ: Jason Aronson. Potegal, M., & Davidson, R.J. (1997). Young children’s post tantrum affiliation with their parents. Aggressive Behavior 23, 329-341. Potegal, M., & Davidson, R.J. (2003). Temper tantrums in young children: 1. Behavioral composition. Development and Behavioral Pediatrics 24(3), 140-147. Potegal, M., Kosorok, M.R., & Davidson, R.J. (2003). Temper tantrums in young children: 1. Tantrum duration and temporal organization. Development and Behavioral Pediatrics 24(3), 148-154. Hello and welcome to the Your Parenting Mojo podcast. Today’s episode is the second in a two-part series on tantrums. The first part ran a few weeks ago and talked about the study done in 1931 that really forms the backbone for all of the research on tantrums that has been done since – and I was surprised to see that actually not a ton of research has been done since, so that first study really remains the gold standard in terms of the basis of our understanding of tantrums. This episode builds on that study and considers the more recent literature that can help us to understand what’s going on in a tantrum as well as methods we might try to avoid tantrums in the first place, and get through them once they start. Much of the more recent work to understand tantrums has been done by Michael Potegal at the University of Minnesota. He published a two-part series of articles a while back now, in 2003, which aimed to understand what kinds of behaviors and for how long tantrums tend to last in children. The first paper was on the behaviors in tantrums, which were gathered via a phone and follow-up mailed survey of 1219 families in Madison, Wisconsin. I should note here that if you’re a white middle-class parent of a toddler and want to understand more about your child’s tantrums then great! You’re in the right place. Michael Potegal found his families by getting in touch with parents who announced their child’s birth in the local newspaper who were largely white, college-educated, and middle-class people in and around Madison, Wisconsin. So if you are not a white middle-class parent then it’s definitely possible that your child’s tantrums might be different from the behavior I’m going to describe here. Unfortunately there seems to be literally no data on tantrums in other cultures within or outside of the U.S.. The first thing to get clear on is “what is a tantrum?” It actually turns out to be quite difficult to define. The parents who were surveyed reported everything from a brief isolated incident of negative behavior to full-blown screaming, kicking, and falling down. The parents described a continuum of intensity and complexity, and the researchers found that while it’s clear what a tantrum is, it was hard to define what it *isn’t* – which is to say that while parents don’t like to call an episode of less than 30 seconds in duration a “tantrum,” the researchers found in a subsequent study that the same behaviors that are seen in a tantrum are found in little mini tantrum events that only last 10-20 seconds. So they ended up defining a tantrum as a negative emotional episode containing at least one of a set of behaviors, no matter how long the episode lasted. The behaviors included in the set were stiffening of the limbs and arching the back, dropping to the floor, shouting, screaming, crying, pushing or pulling, stamping, hitting, kicking, throwing, and running away. The tantrum officially begins when the first of these behaviors is noticed and ends when the last of them has stopped. On to the results: 87% of children between 18 and 24 months old experienced tantrums, and this number rose to 91% between 30-36 months before dropping to 59% between 42-48 months, which mirrors the results found in a different study as well. So parents of the almost threes – you guys are in it right now, as Natalie Portman’s character said in the movie Garden State. Give it another year and there’s a better than even chance you’ll still be in it, but hopefully the prevalence of tantrums continues to decline after that. The researchers found that several different types of behaviors were correlated, meaning they often occurred together in tantrums. So screaming, kicking, stiffening, and hitting tend to be grouped in what the researchers called a High Anger tantrum, while whining, crying, and attempting to get comfort, perhaps by hanging off your leg, were part of a different group of behaviors called Distress. Finally, stamping, shouting, and throwing were identified as a Low and Intermediate anger group. I actually found this categorization really helpful to understand what my daughter might be feeling when she’s experiencing a tantrum based on the behavior she shows. The second paper in this series looked at the duration of tantrums. You may find it encouraging to know that most tantrums are actually quite short, although I’m sure they don’t feel that way when you’re in the middle of one. The median length was three minutes, so half of tantrums were less than that long and the other half were more, with the majority being less than about six minutes in duration and the remainder were one or two tantrums of a variety of durations up to 39 minutes. The duration didn’t seem to be affected by the child’s mood before the tantrum or the issue that triggered the tantrum. Intensity was linked to duration, and if the child stamped or dropped to the floor in the first thirty seconds, the tantrum was likely to be shorter in duration. The tantrum seems to involve the expression of two independent emotions that overlap in the tantrum: anger and distress. The physical expression of anger tends to increase quickly and peaks at or near the beginning of the tantrum, expressed most intensely as screaming and kicking, but also sometimes hitting and stiffening. Crying and looking for comfort tend to increase over the course of the tantrum, and form a larger part of the tantrum than the initial anger. The researchers hypothesized that children initially become angry when they realize that the parent doesn’t intend to give the child what he wants, and this anger turns to sadness as the child realizes that getting angry won’t help to get what they want either. In a later study, Professor Potegal and a colleague embedded a microphone into a onesie so he could record tantrums as they occurred, and then analyzed the sound frequency and amount of energy above a frequency threshold to understand the duration of anger vs. distress in a tantrum. It turns out that while anger does peak at the beginning, it is overlapped with distress throughout the tantrum. As a parent, you can watch for those signs of anger – if you try to pick your child up while he is still angry he will likely resist your touch by arching his back. In fact, one of Professor Potegal’s studies found a correlation between parental intervention in a tantrum and the duration of the tantrum, so if the parent intervened, the tantrum tended to last longer. Contrary to the way that this study has been reported in the news media, the study found correlation but not causation – it is not at all clear whether the parent’s intervention in the tantrum made it last longer or whether the parent decided to intervene because it seemed like the child was having an especially long tantrum. Try watching for the signs of anger like kicking and screaming and yelling to subside and signs of distress like crying, falling to the floor, and coming to you for comfort before you offer comfort. A different set of researchers found that children are more likely to seek some kind of affectionate response from parents as they get older (within the range of 18-63 months that was studied), and also if they screamed for a long time, and if they were separated from the parent during the tantrum. Each of these factors points to prolonged distress in the child, and some researchers say that maybe children also feel shame, guilt, and embarrassment about their tantrums as well. I do want to think about the idea of separation from the parent for a minute. In contrast with how researchers used to think about tantrums in the 1950s and 60s where people thought it was more of a performance for parents and if you left the tantrumming child alone, he would stop the behavior. This was consistent with the behaviorist approach to psychology that was popular at the time which saw parental attention as a kind of “reward” for the tantrum behavior. But more recent research shows that if this separation is initiated by the child (like the child running away from you), then the child probably won’t be too distressed by the separation. The distress is much worse when the separation is initiated by the parent, when the parent leaves the child alone to work through the tantrum by himself. It also may also convey to the child that whatever emotions she’s feeling are unacceptable, and that their parent can’t cope with strong feelings. The child may also feel scared about being isolated when they’re feeling such intense emotions. So if you find the tantrum really presses your buttons and you might be in danger of harming the child if you stay in close proximity, then by all means leave the child alone for a few minutes. But if you can stand it, stay. You might duck out for a few seconds to grab some earplugs and come back to sit near your child. Once the anger has subsided, let your child know that you’re there and ready to help whenever he is ready to accept it. Unfortunately, most of the literature that even well-regarded papers about tantrums in toddlers cite on the management and control of tantrums tend to be about situations not very applicable to toddlers. One study describes “a clinical literature on tantrum control” but it turns out that this “literature” is comprised of two studies, one of which followed three *severely* mentally disabled children in a residential facility and found that rewarding them for good behavior dramatically decreased the instance of tantrums, while the other is on tantrums in institutionalized teenagers. Hardly the ideal basis for a study of tantrums in normally developing toddlers! Assuming that this finding holds true for young children (which the researchers made no attempt to test), this study has simple but profound implications for how we might be able to help toddlers deal with their emotions in ways more productive than tantrums. Children begin to talk about emotions at about age two or three, so while I’m not aware of any research that directly proves this, the results of the study on adults imply that if you can help along the process of children naming their emotions they might feel those emotions less strongly. So our job is to help get our children from the point where they don’t have any distance between the emotion and the action (they feel angry and they immediately hit) to the point where they can label emotions, bring them from the unconscious mind to the conscious mind, and thus regulate them in a more socially-acceptable way. We can do this by supporting them as they express their own emotions, which means accepting their emotions. Let’s say your son reaches for a sharp knife and you need to prevent him from touching it. If he really wants to touch it he might have a flash of anger and scream or maybe even try to hit you or something. But what if you say “you really wanted to touch the knife. You seem really angry.” This is basically the advice given by practitioners of the Resources for Infant Educarers approach to young children’s development, and it’s only in the course of doing research for this episode that I learned why RIE suggests this wording. It’s what we do with our toddler and while she’s never responded to say “yes, I’m angry!” when we prevent her from touching something she wants, and it seems diffuse the situation. While we do get the occasional stiffening and back arching when she can’t do something (or when she’s not feeling great because she’s tired), by and large she gets over it really quickly when we just acknowledge her emotions. I do say “you seem angry/sad/whatever” because I don’t want to presume you understand what she’s feeling. Better to say what I *think* she’s feeling, in case I’m wrong. But if it’s genuinely delivered it can work with people of any age – I remember a training on listening skills I did for work years ago where one participant had to describe a difficult situation and the other had to say how he thought the first was feeling until the first person said “Yes! That’s how I felt.” I remember it being quite a cathartic feeling to know that somebody else understood how I felt about the situation I described. Mother: What do you mean, sweetie, you’ll have a wonderful time. Child: No I won’t. I hate Melanie. Mother: You don’t hate her. Don’t be silly…I know you love going to Melanie’s house, and it’s always fun to go to parties. By telling the child how she feels (you don’t hate her) and invalidating her feelings (don’t be silly), you set yourself up for a classic cause of tantrums – the child feeling misunderstood. The authors cite other common causes of anger as being frustration with limits, a desire for independence, perceived injustice, not wanting to share prized possessions, not being able to complete physical tasks, anxiety and embarrassment, among others. The long list of potential causes of anger and tantrums might sound a bit intimidating – it certainly did to me. But then I realized I can use this information to prevent some tantrums, by doing things like putting favorite toys away before friends come over, and by helping with a task *just enough* to help my toddler succeed – there’s lots more information on that in the episode called “Scaffolding.” But my job is not to prevent all tantrums. The more I prevent the easier my life is, but eventually my daughter and I are going to disagree. What do I do then? Then I reach into my “naming feelings” toolbox. The Social and Emotional Prevention book authors describe a really interesting approach to a child whose tantrums had gotten really out of control at preschool (p.130). But you don’t have to wait for a tantrum to start helping children to learn about emotions. When you’re reading stories with your child, point out the emotions that the characters are feeling. Point out the features that lead you to label that specific emotion: “Oh, Harry has his mouth wide open and his eyebrows are raised. He looks really scared!”. My daughter’s daycare has photographs of the teachers acting various emotions with their faces, and they encourage the children to point out which face resembles how they feel. But let’s take a step back and talk about limit setting, because this really seems to be an important key to reducing tantrums. Limits help you to define what is acceptable behavior and what isn’t, and the two important factors here are to set a limit for a reason, and to set it before you get angry yourself and do something like yelling at your child that’s pretty sure to result in a meltdown both for you and for your child. I actually find the getting angry thing to be a helpful cue for me – it tells me I should have set a limit already and that I should set it earlier next time. And having a reason behind the limit helps me to stick to it, which helps my toddler to understand where the limit is. A good example is how she sits on chairs – we require that she have either her knees or bum on the seat, because the chances of her falling or tipping off the seat seem to be much higher if she’s standing than if she’s sitting or kneeling. We word it positively – what she can do – rather than negatively – what she can’t do – so we’re setting a limit but still (in a way) saying “yes” to her by telling her the thing she’s allowed to do. We’re also giving her a choice – she can decide whether she sits on her knees or her bum – so she still has some control over the situation. She has tried to test it at various points by having her bum on the seat but being half up on one foot as well, or having one knee and one foot on the seat as well. All of these are very normal behaviors – she’s testing the boundary of the limit to see whether I really mean it. As long as I respond consistently each time then over time she tests less and less on this particular issue. Psychologist Henri Parens says that parents should set a limit as soon as they know the limit is needed (and really only when it’s needed), even with very young children. And he advises distinguishing between setting limits and punishing, because the two are very different. A limit can be set in a very clear, direct way: “I’d like you to put your knees or your bum on the seat, please,” which we’ve shortened over time to a cheerful “knees bum please.” If she doesn’t comply (which she almost always does), then I say “knees or bum on the seat please, or I’m going to have to ask you to get off the chair.” Sometimes she will then get off the chair willingly by herself if she prefers that option but occasionally I do have to lift her off the chair – at which time she might well protest by having a tantrum. At that point I have absolutely no problem accepting her feelings, because I know the limit was necessary. It’s not safe for her to stand on a chair. So in the early stages of a tantrum I’ll usually stroke her back gently and say “you really wanted to stand on the chair, huh. (pause for a second for her to acknowledge if she wants to.) It’s not safe to stand on chairs. And then I don’t say a lot else until she seems to be out of the ‘angry’ phase at the beginning of the tantrum and into the distress phase when she starts to look for me to comfort her. Then I offer to give her a hug if she wants one (which she usually does), and eventually she calms down and we move on. My approach to tantrums has been refined over time, and it may not work for you. I’d suggest you try a variety of different techniques to diffuse anger before the tantrum starts – the Social and Emotional Prevention book authors recommend talking to the child about ways to calm down, perhaps by using a slow breathing technique. At other times the child may want to be held, or you might want to suggest ways to express anger in an acceptable way like jumping on the trampoline, or going into your bedroom and shouting really loud, or going to a quiet room (with the parent, not in time-out) for a few minutes. The child might also be embarrassed or worried about being rejected, so accepting all of these feelings is important. And when they’re in the middle of a tantrum some children might want to be held, but others don’t want to be touched. When the tantrum seems to be winding down, a distraction can help stop if from winding up again – not an “I’m going to dangle my shiny keys in your face” kind of distraction that people sometimes do to babies, but maybe a “Hey, I was going to ask you if you’d like to bake cookies. Do you want to do that now?”. You won’t prevent all instances of behaviors that are associated with tantrums until children fully develop executive function and self-control, which comes slowly, over time. But maybe some of the things we’ve talked about today can help you to understand them and cope with them. I know I found the few tantrums we’ve experienced easier to deal with when I just accepted them and let them run their course, rather than trying to shorten them. I guess it’s kind of a metaphor for parenting – accepting what comes is ultimately easier than getting too invested in a particular solution. 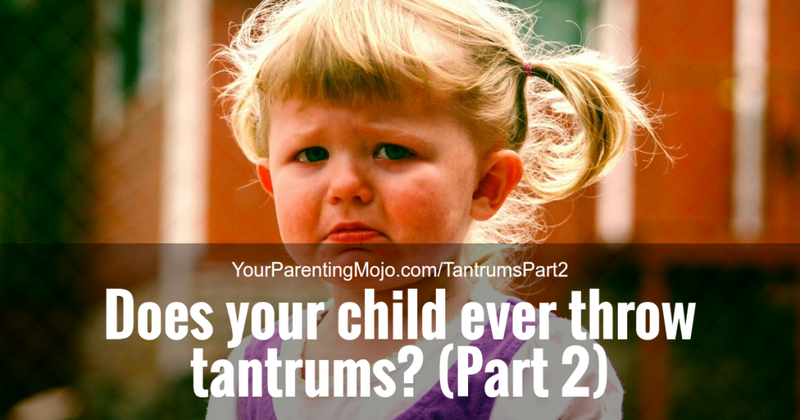 Find the references for this episode on yourparentingmojo.com/tantrums part 2.